The Nester is holding a National (not really) Take A Risk Day. Check it out. It's not about showing off the cutest and best thing you've made. It's more of showing off something that's imperfect, but still being glad that you took the risk to even try it. 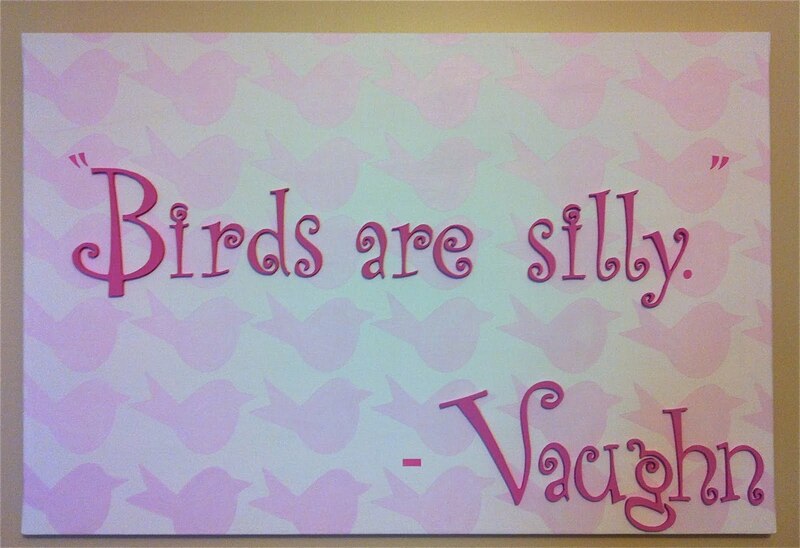 It's a largish painting that I did for Vaughn's room. It started out as something completely else. That idea didn't work, the next one didn't work either. Nor did the next idea. I was ready to toss it. I'm sure Justin was ready to not see it on the dining room table. I have a hard time finishing projects or even starting projects for that matter. Either I get so frustrated that it's not working out as planned that I chuck the entire thing or I think of all the different ways a project could be done and I can't commit to one, so I never even begin. Both ways leave me with the same result: no final product. Enough was enough. Even knowing half way through that it wasn't going to be what I wanted it to be, I promised myself that I would stay on course and finish it. And I did. And it felt good. So, again, not even close to be happy with this, but it's fine. When I get another idea I can rip off the letters, sand it down, and start again. No harm, no foul. My process, explained quickly: I drew a bird and made a stamp from it. I painted the background white, then mixed a light pink for the birds. (I added glaze to the light pink to give it transparency and shine.) I bought the letters and painted them a darker shade of pink. 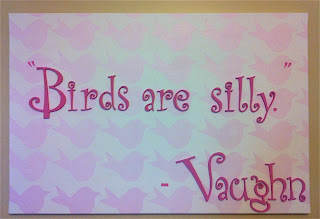 (Vaughn actually said that to me one day while outside swinging.) I glued them on using Elmer's all purpose glue. What hasn't worked for you lately??? I agree with Deb. I like the how you battled thru the process too.